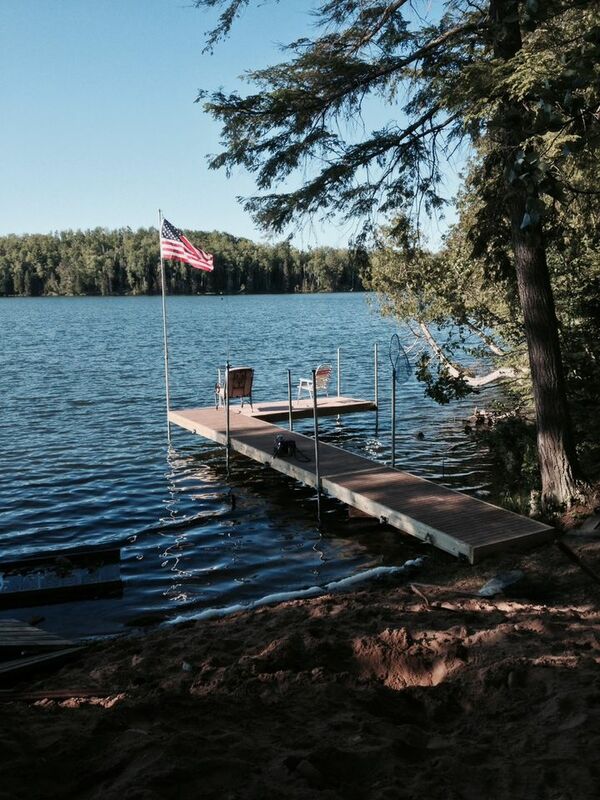 HORSESHOE LAKE COTTAGE (near Republic, MI) -- Private, peaceful 3 bedroom, boats included, private dock, pets are welcomed! 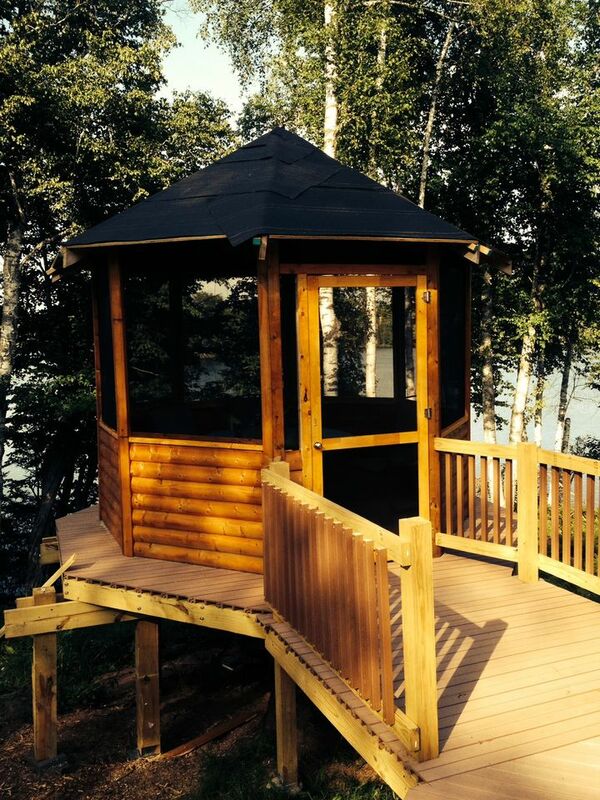 The Horseshoe Lake Cottage has a beautiful view situated right on the peninsula. 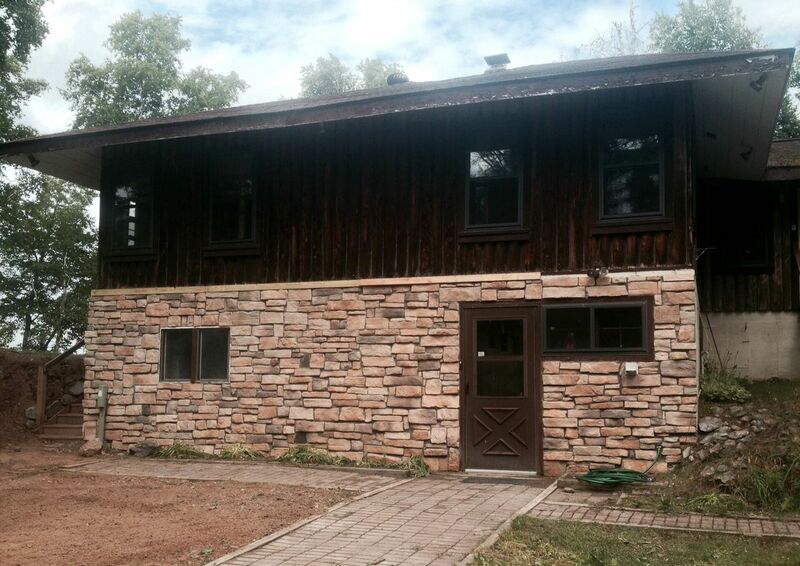 Enjoy 2200 feet of private, waterfront peninsula in Michigan's Upper Peninsula. Very secluded and quiet. 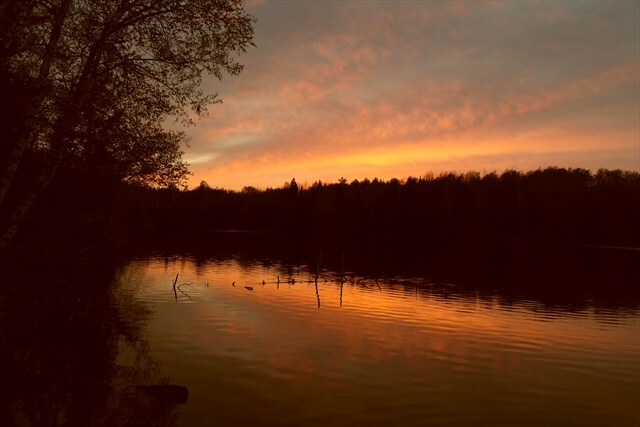 There are only 4 other cottages on the gorgeous 220 acre Horseshoe Lake, near Republic, Michigan. Horseshoe Lake is mostly a sandy bottom beach, yet it is rocky in some parts. Its depth ranges between 10-15 feet deep, with a few spots at 20 feet. The property owners have created a small, beach area on a part of the peninsula. It has a slight incline. Kids absolutely love to play in the sand in this area. Great for fishing, privacy, and relaxation, This cottage has three-bedrooms with gorgeous views throughout. Windows surround the cabin, which makes you feel connected to nature.The Horseshoe Lake Cottage provides a very spacious and comfortable area, both inside and out, with plenty of space to spread out and enjoy. The master bedroom is spacious with a king-sized bed and TV w/ DVD player. 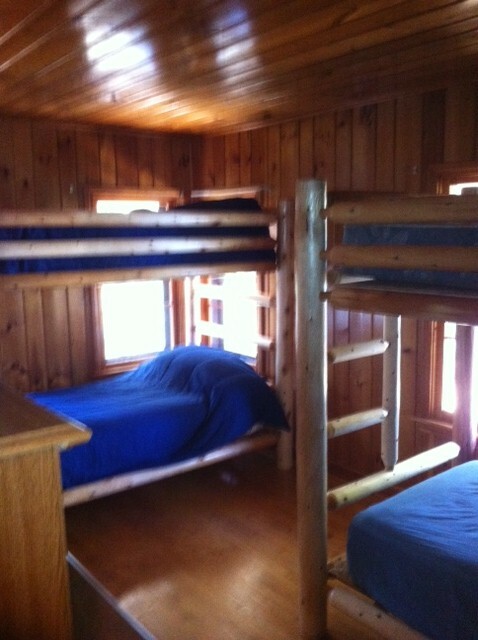 The other bedrooms have bunk beds-- one with a double bed below. We also provide a washer and dryer downstairs for your sole use during your stay! A simple boat is included during your stay. Plus, a 2 person paddle boat was just added! Fun for all. Air-Conditioner: - No, we have 3 fans at the cabin. Plus, with the wonderful cross-breeze on the peninsula, it hasn't been an issue. Bathroom: Full bathroom (sink, toilet, shower/tub combo). Beach/Swimming: Your own, small, private, sandy beach!! It is approximately 20x30 feet. The kids just love the sandy beach at Horseshoe Lake. The lake is great for swimming, the bottom of the lake is mostly a sandy/rock mixture. Depth of the lake ranges from 10-20. We have a basic fishing boat for your use, which is included in your rental. We also have an electric trolling motor, with a marine battery attached for your use. *NEW ADDITIONAL RENTAL OPPORTUNITY (NOT INCLUDED in the standard rental rate for the cottage) 16 foot - Hybrid electric boat- no gas needed. Please call the owner, Jay, directly for more information at (630) 803-0418. Jay will have all the information and paper work for this additional rental option. Rates start at approximately $100 per day or special weekly rates. Boat Launch: If you are bringing your own boat, there is a beautiful public boat launch on the north east side of the lake. Cable/Satellite TV: Yes, there is satellite TV (Dish Network). Cell phone service: Cell service is spotty in the Upper Peninsula. Still, we have found that Sprint seems to provide the best service in the area. AT&T has been pretty good as well. Coffee Pot: Yes, we have a coffee pot at the cabin. At times there is coffee available, yet we highly recommend that you bring your own. We do not inventory the coffee. Fishing: Great fishing from the dock or boat. Fishing License: You can purchase your fishing license online here! Fishing poles: Please bring your own poles! Grill: - We have an outdoor propane grill for your use. Also, there is a built-in charcoal grill pit by the fire pit. Grocery Store: The closest, full-sized grocery store is about a 1/2 hour drive from the cabin, Ishpeming. It is the IGA Jubilee right on U.S 41. If you are driving from Wisconsin/Chicago, the last grocery store is in Iron Mountain. There is a little store in the town of Republic, about 15 minutes from the cabin, yet there isn't a large selection, and the prices are convenience-store equivalent. There is a larger convenience store/BP Gas station on the corner of U.S. 41 and MI-95, about 20 minutes North of the cabin. 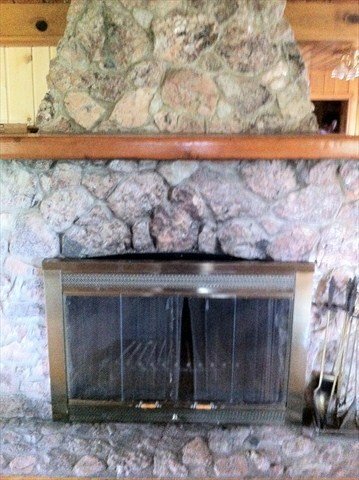 Heating source: Not only do we have the fire place, yet we do have forced air heat. 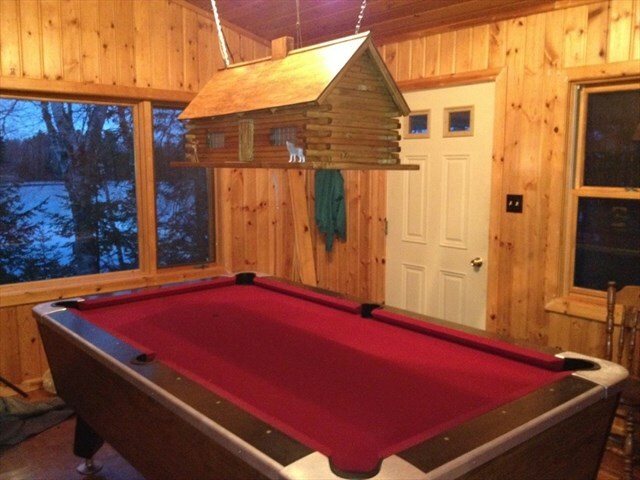 The Horseshoe Lake Cabin is much more like a house. It is not a rustic cabin. Hunting: We do not allow hunting or shooting (even just at targets) of any kind on the 20 private acres, or the adjoining private property. N13195 Highway M95, Channing (within 10 miles south of the cottage, on the west side of M-95). Kitchen Supplies The basic kitchen supplies are at the cabin. Basic dishes, pots/pans, glasses, cups, etc. are provided, including basic kitchen spices. Still, we do not inventory these items, so if there is something specific you would like, we highly recommend bringing it. Linens: Yes, we provide your sheets. 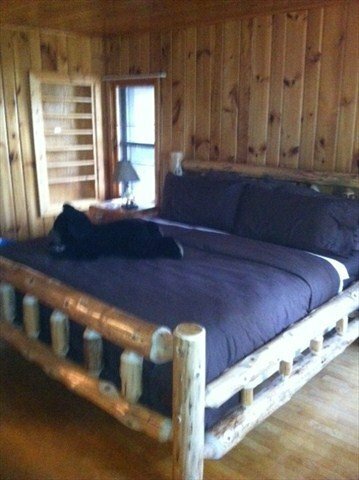 Just like a hotel, the beds will be made for you upon arrival. If you are fussy about the thread count of your sheets, just let me know, and I’ll make sure we leave a bed open for your sheets. We have just the basic sheets, pillows, pillow cases. Pet: Only 1 dog is allowed. Freshwater Vacation Rentals currently charges $50/per pet. *this property is also situated on 20 acres and not fenced, it is your responsibility to watch and clean up after your pet. Privacy: Semi-private; you are on a private peninsula. There are only 4 other cottages on the lake. Towels: Yes, we provide towels. It’s always good to bring extra beach towels. Wood: Bring your own. It can also be bought at the local grocer. 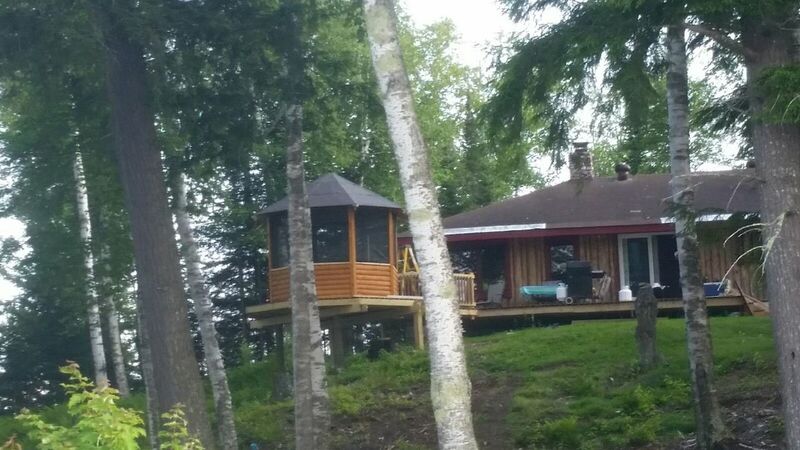 Cabin is on a peninsula and has beautiful views of the lake. Nice size cabin. Good fishing. We had a great time at the Horseshoe lake cottage. We caught tons of fish. The cottage was clean and felt homey. Only thing that would have made the stay much better was a fish filet station. It was difficult finding somewhere to do it but we made due. And brought back a ton of fish. We made somme great memories this year. Thank you. A secluded, peaceful lakefront retreat.